There is a reason why these are popular strikes for many investors. When an option is sold, we generate an option premium that is ours to keep no matter what happens to the stock or whether that option is ultimately exercised. In the case of an O-T-M strike, we have an opportunity to make additional profit on stock appreciation. For example, if we buy 100 x XYZ @ $28 and sell the $30 call, we can generate an additional $200 on the sale of the stock (28 to 30 times 100). When we sell at-the-money or in-the-money strikes, there is NO CHANCE of such additional profits (additional capital can be made via exit strategies but that’s an article for another day). So from a profit perspective, O-T-M strikes are more attractive. Blue Collar Investors love profit but understand that it is only part of the big picture. Not factoring in risk is a major error that many covered call sellers make and in my view is what separates the men (women) from the boys (girls). An example would be if we buy a stock for $32 and sell the $30 call. We are obligated to sell our shares for $30 per share. If the equity goes from $32 to $40, we make no additional income due to our obligation to sell @ $30. The option premium we receive from the sale of this option has an intrinsic value of $2 (32 – 30). The remaining option premium is time value and our true profit (ROO). However, the $2 additional premium we receive from this I-T-M strike will give us downside protection. For example, if we sell the $30 call for $3.50, we deduct the $2 of intrinsic value for an option profit of $150 per contract. This represents a 5% return. This profit is fully protected as long as our shares do not decline below $30. This $200 per contract represents a 6.3% downside protection. In other words, we are guaranteed a 5% 1-month return as long as our stock price does not decline by more than 6.3%. When the strike price sold is the same as or close to (near-the-money strike) the current market value of the security it is said to be at-the-money. These strikes return the greatest initial option returns but offer no upside potential or downside protection of the initial profit. It is a bullish position to take. 1- Your risk tolerance: If you can’t sleep at night when your portfolio value declines, opt for the I-T-M strikes that offer more downside protection. Be sure not to complain if your shares appreciate! 2- Market Tone: In an uptrending and stable market environment, O-T-M or A-T-M strikes make sense to take advantage of share appreciation and/or initial returns. In a volatile or bearish market, I tend to favor I-T-M strikes. 3- Technical Analysis: The stronger the chart pattern of a stock, the more likely I am to sell an O-T-M strike. This would involve uptrending moving averages with all confirming indicators (see Chapter 4 of my Encyclopedia for Covered Call Writing). Laddering is an investment technique whereby investors purchase multiple financial products with different maturity dates. For example, when I purchase bonds (boring!!!! ), I may buy 1,2,3,4 and 5 year maturations. This will protect me from interest rate risk. I have borrowed this term and applied it to strike prices. Each month, I will try to have a mix of I-T-M, A-T-M and O-T-M strikes. In a favorable market environment, I will lean towards more O-T-M. In a volatile or declining market, more I-T-M strikes. This is just another way of throwing the odds in our favor. It’s not a guarantee but rather a smart, sophisticated approach to cc writing that few others even think about, never mind actually employ. When determining which is the best strike price to utilize for cc writing we must factor in several parameters. Market assessment, chart technicals and personal risk tolerance are the three most important parameters to consider when making these investment decisions. In addition to the live events listed in last week’s article I will be appearing in Milwaukee, Wisconsin on Saturday, January 19th. Details to follow. For the week, the S&P 500 rose by 0.9% for a year-to-date return of 14.4%, including dividends. How do you get the 3.8% ROO and 10.5% downside protection in the example from your article. Thanks for sharing this information. For our members who are mathematically challenged, the Ellman Calculator will come to the rescue! The Weekly Report for 08-17-12 has been uploaded to the Premium Member website and is available for download. 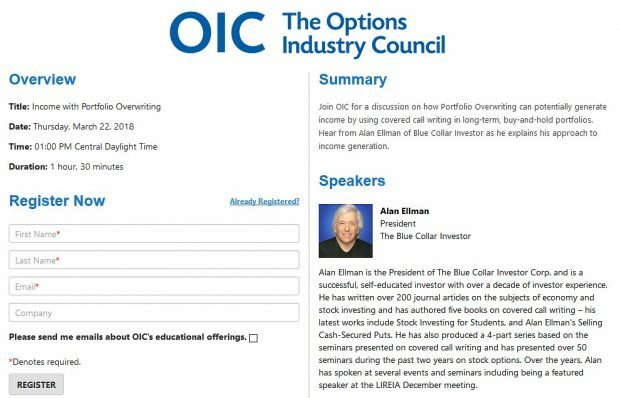 Alan, I see that you’re now bullish enough to “slightly” favor OTM strikes. How much weight do you put in the VIX as a market trend predictor? With the VIX at its lowest level since early ’07, I would think this means the market almost “has” to go down. Or are you taking more of a point-of-view that we can’t predict the market and it’s been going up so keep trading that way until the month comes when it does start its descent? Since our time frame is short with covered call writing, we only need to evaluate for that time frame. In my opinion, the first 3 factors are leaning bullish and the last is unknown. I am especially encouraged with recent housing and construction news both for my stock market and real estate holdings. A bonus bullish potential factor is the trillions of dollars still on the sidelines as a result of the crash in 2008. So, overall, I am moderately bullish slightly favoring OTM strikes. 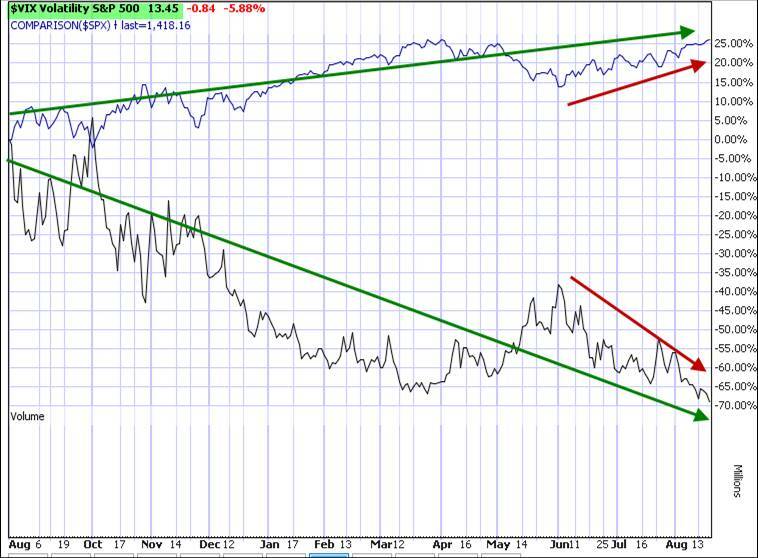 Now, as you point out, the VIX is at a multi-year low (13.45) and as you can see from the chart below, it is declining both in the near term (red) and long term (green). For our short-term needs, this is a bullish factor in my view but only one of the factors I evaluate in my overall market assessment. On your latest report DSW is expected to report earnings on the 21st. If the report is favorable will the option premiums % increase? Right now the returns appeaer to be about 2.5% for the 60 and 65 options. The report is scheduled to be made public before the market opens tomorrow. I noticed the stock was down 2.25% today meaning that a disappointing report is expected by many. If the report is favorable the share price will likely accelerate but the % return on the option may decrease. This is because the implied (expected) volatility of the option is less after the report than it is before the report. With a lower IV and a day or two less time to expiration the % return will likely fall but it still may be a good investment. I’m having trouble finding winners lately. Stocks appear for a week or two and then disappear from the list. I like them too have been on the list for a while – this crazy market makes that difficult. How are others handling this? Once a stock is selected for a cc trade, it is managed by the use of exit strategy executions when applicable and NOT by it’s removal from the “eligible” section of the running list. The BCI screens are extremely difficult to survive and oftentimes a stock is eliminated from the “eligible” section because of a minor dip below the 20-d ema for example. The next week it may pass all screens. We keep all stocks that have been on the running list until it has not been eligible for 3 consecutive weeks after initially being placed on that list. In some of your articles you use the single tab and in others the multiple tab of your calculator. Please explain the difference. Glad to help andwelcome to our BCI community. The “single” tab is best suited when evaluating the strike prices of one stock. The “multiple” tab was constructed to evaluate one or more strike prices for up to dozens of different equities. Hi Alan, I have read your last 2 books which had been enjoyable and informative to read too. 1. Can I use the RSI indicator instead of MACD? 2. Would you wait until the next day to put on a trade if there is a high volume break of an ‘EMA’,etc as you only use daily volume? 3. If I am seeing the S&P500 and VIX charts before putting on trades (and monitoring shares), then do I use all the same indicators on these as you mention to use for the shares? 4. If I use A/D line charts instead of VIX, then do I need to put any EMA’s on chart?, if so then what ones? 1- Yes. RSI is a momentum indicator as is MACD and stochastics. Readings above 70 are considered overbought; under 30 oversold. In between readings are considered neutral. 2- If there is unexpected news that causes a high volume break above ema I will wait for the price to settle before entering a trade. Otherwise, the only trading restriction I use is to enter most trades between 11AM and 3PM EST to avoid early and late market volatility. 3- I do not. I view the charts of the S&P 500 and the VIX (usually 6-month charts) to assess overall market tone whereas I use the EMAs, MACD, STO and Vol to determine SHORT-TERM price activity of our cc candidates. I identify trend and then evaluate short-term momentum in this latter case. The Advance Decline line (AD Line) is a breadth indicator based on is the number of advancing stocks less the number of declining stocks. “Net Advances” is positive when advances exceed declines and negative when declines exceed advances. The AD Line is a cumulative measure of Net Advances. It rises when Net Advances is positive and falls when Net Advances is negative. 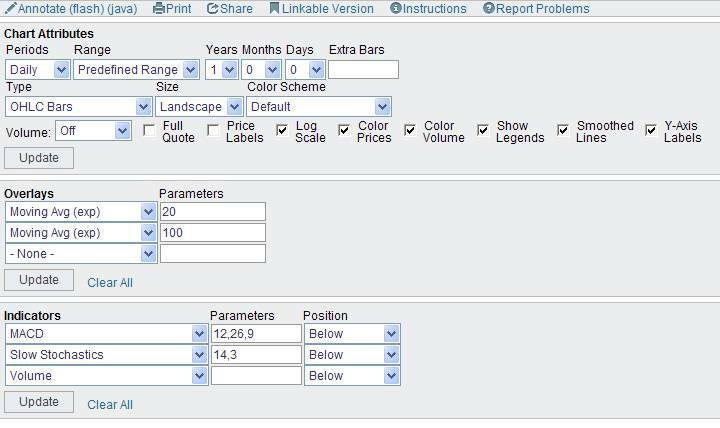 Technicians can plot the AD Line for the index and compare it to the performance of the actual index. The AD Line should confirm an advance or a decline with similar movements. Bullish or bearish divergences in the AD Line signal a change in participation that could foreshadow a reversal. I do not use this indicator although it is used by many chartists. If I did, I would not use an EMA so the setting would be 1-d SMA (simple moving average). Let me re-iterate that there are a myriad of useful technical indicators. I share with our BCI community the ones that I use but have no problem with those that choose others. Hi Alan, in this article you talk about selecting the best strike but do you worry about selecting the best day? I know the farther away from expiration the more premium but what if the market tone is down for the day. Will you wait until a flat or up market tone to buy stock/ sell call (buy-write) or will you just put the trade on asap? I had stock called away on expiration Friday and know I want to jump back in on Monday. Thanks! The main guideline I use for trading timing is to trade between 11AM and 3PM EST to avoid early morning and late afternoon volatility. I use charts of the S&P 500 and the VIX to evaluate multi-month market tone as opposed to daily timing. Thanks for the reply Alan! When you setup your monthly charts do you use the same indicators as your daily setup? Would you use those same indicators on the weekly chart as well? Thanks! I am a firm believer in writing 1-month options. The image below demonstrates the chart attributes I use for ALL my cc candidates. Click on the image to enlarge and use the back arrow to return to this blog. The Weekly Report has been revised and is available for download. There was a formatting edit to improve readability. There were no changes to any of the data items. Look for the report dates 8-17-12-REVA. 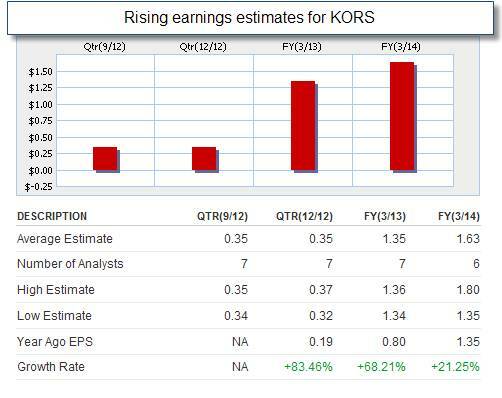 On August 14th, KORS announced its 1st quarter, fiscal 2013 earnings and it represented a 70% positive surprise. Earnings were up 161.5% year-to-year and revenues up 71%. Gross profit increased by 83%. KORS boasts a 12-month trailing Return on Equity (ROE) of 33% (efficiently re-invests earnings) compared to its industry peers 20.6%. Our premium “running list” shows an industry segment rank of “B” and a beta of 1.08. As a result of this strong performance, earnings estimates have been on the rise as shown in the chart below (CLICK ON IMAGE TO ENLARGE AND USE THE BACK ARROW TO RETURN TO THIS BLOG). Put in ticker to get quote and be careful to check the “C” row for call options. Can you please send me a disc of EOSC to be installed in my computer?